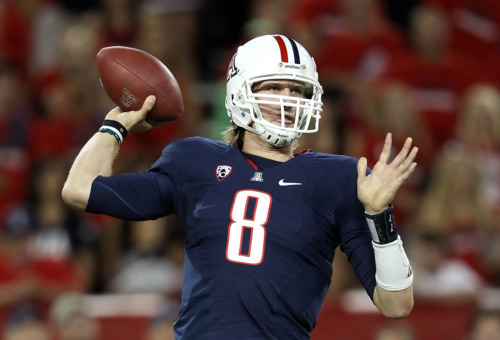 I have a theory about the Eagles third round selection of quarterback Nick Foles. Despite the relatively early pick, it has nothing to do with replacing Michael Vick or even Mike Kafka. It’s about the NFL draft and the dramatic quarterback inflation that has occurred in the last two years. Let’s take a quick journey back to 2010. Sam Bradford went first to the Rams and Denver jumped up to 25 overall to get Tim Tebow. The next quarterbacks off the board were Jimmy Clausen (#48), Colt McCoy (#85), and the Eagles’ Kafka (#122). 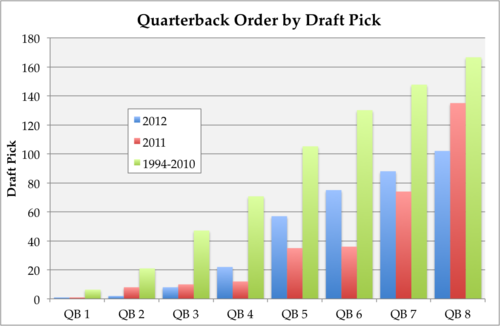 That order of quarterbacks coming off the board — two in the opening round, another one in each of the following — is right in line with what had been going on ever since the draft was whittled down to seven rounds in 1994. But that pattern, largely consistent for the previous 15 years, was thrown out the window over the last two. In 2011, four quarterbacks were drafted in the first round, and six in the top 40 picks. That rivaled two of the biggest quarterback-heavy drafts in recent memory, 1999 and 2004, despite talent that few considered equal. Then this most recent draft saw another four quarterbacks taken in the first, something that’s never happened in two straight years. Overall, the 2012 draft was slightly behind the 2011 pace, but it was still far ahead of nearly any prior draft. What does this mean about Foles? It means that the Eagles likely drafted a worse quarterback in an earlier round than they ever would have before. For example, the team selected Kafka in the fourth round of 2010, presumably to be a long term backup they could groom. He was the fifth quarterback drafted overall. Foles, taken a round and a half before Kafka, was only the seventh-best quarterback according to draft order. Perhaps this year’s crop of quarterbacks, and Foles in particular, is better than the group teams had to choose from in 2010 — and nearly every prior year. But my impression is that most experts considered this, pre-draft, to be at best an average class after the two stars. Two years may be too soon to confirm a trend, but the evidence is there. Quarterbacks have never been more highly valued in the NFL. Desperate teams without a franchise signal-caller give big contracts to former backups and trade for anyone with promise. It only makes sense that such a frenzied demand would trickle down to the draft. As that happens, quarterbacks with starting potential rise from the second and third rounds into the top 30 picks, and those who might have been considered late round projects jump up to take their place. Suddenly, this starts to look less like a fluke and more like a serious shift in how quarterback prospects are valued. We would be wise to view the Foles pick with that in mind. Tagged with Philadelphia Eagles, NFL, NFL Draft, Quarterback, Nick Foles, Mike Kafka, First Round, Statistics, Graphs, Free Agency, 2011, 2012.